The Cycle Chic Radar is filled with elegant blips these days and one of the biggest flashing dots is Toronto's 416 Cycle Style. "From the multicultural flavored, and kaleidoscope styled streets of the 416 in TORONTO, we span the neighborhoods and asphalt in search of new aromas and combinations of visual and edible delights. Armed with a crank and a camera we search. Freezing moments in time of the familliar strangers sharing space and riding by." Even hard to impress Treehugger is begrudgingly impressed. 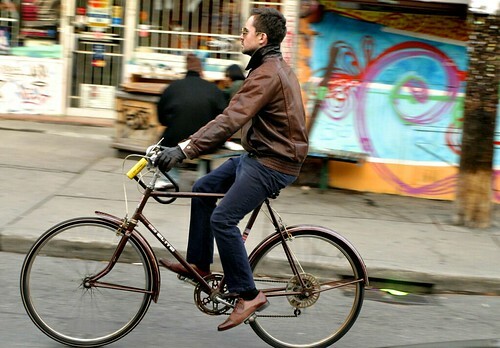 416 Cycle Style... meet Copenhagen Cycle Chic's RSS Feed. Unfortunately for Toronto, if councillor Michael Walker gets his way, those chic cyclists will be wearing helmets AND have a special license. I've emailed him asking if he plans a helmet law for motorists and pedestrians as well. Still waiting for a response. It looks as though it's getting colder in Toronto! Love the colours of the cyclist in the top photo. Thanks to Mikael for fueling the inspiration to bring Toronto a little bit closer to achieving a culture that embraces its citizens whether they ride a bicycle or not. I appreciate all the support from the global Cycle community. We would like to use one of your cycle chic photos for our new blog: iflynonstop.com. This coming Monday we post a blog from Jay Graves, owner of Bike Gallery who visited AMS October 2008, Mikael was his guide. We are wanting photos(1-2) showing cyclists in chic non-spandex attire like we use here in Portland. Folow the bike (bicicleta) in Tramagal. Sadly one of the writers at the supposedly pro-cycling spacing.ca also advocates walkerish measures as a "compromise" in exchange for respect for Toronto cyclists. Such a "compromise" would effectively kill the development of everyday cycling in normal clothing in that city, and by extension throughout Ontario. It was cold a couple of weeks ago, but even here in Montréal (north of Toronto, and colder than them) it is a beautiful sunny, mild day. Lots and lots of cyclists. Very glad to see this blog!